"They absolutely dwarf the black hole mergers detected by LIGO," the Laser Interferometer Gravitational-Wave Observatory, which first detected gravitational waves from colliding black holes in February 2016, "and will be detected within 10 years," says Chiara Mingarelli, a Marie Curie Fellow at Caltech, and currently gravitational-wave astrophysicist at the Flatiron Institute in New York City. .Astronomers won't have to wait much longer for their first glimpse of the most powerful union in the universe. 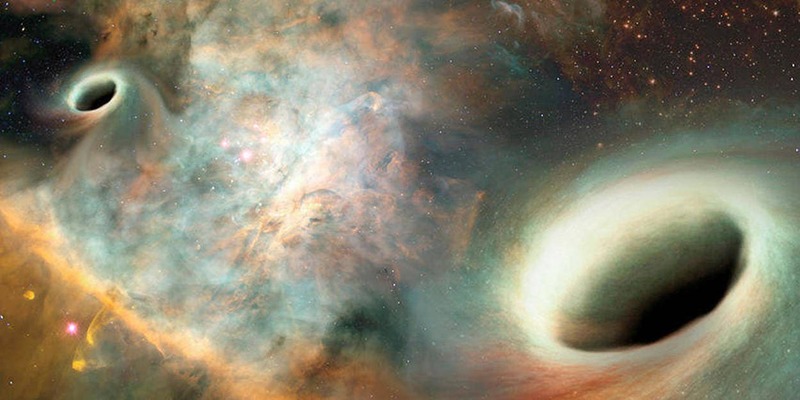 Supermassive black holes will be detected within 10 years. Supermassive black holes live in the heart of large galaxies, including our own Milky Way, and can be millions or even billions of times the mass of the sun. For comparison, the merging black holes detected so far by gravitational wave detectors have been only a few dozen times the sun's mass. "The gravitational waves from these supermassive black hole binary mergers are the most powerful in the universe," says Mingarelli. For the past decade, scientists with the North American Nanohertz Observatory for Gravitational Waves (NANOGrav) collaboration have been listening for a constant "hum" of low-frequency gravitational waves. Theoretical work suggests that this hum — generated by collisions involving supermassive black holes, which contain millions or billions of times more mass than the sun — should be detectable at Earth. NANOGrav hasn't heard the hum yet, a new study reveals, but this lack of detection is an interesting result in its own right, revealing new details of how galaxies might evolve and merge, team members said. NANOGrav currently monitors 54 pulsars throughout the Milky Way using the Green Bank Telescope in West Virginia and the Arecibo Observatory in Puerto Rico, the two most sensitive radio telescopes operating at the necessary frequencies. Team members are hoping to hear a distinctive low-frequency sound. "Whereas LIGO has this high-pitched chirp, pulsar timing arrays have a low growl from all these supermassive black holes combined," Mingarelli said. Mingarelli's study is the first to use real data, rather than computer simulations, to predict when such an observation will be made. The detection of a supermassive black hole merger would offer new insights into how massive galaxies and black holes evolve, Mingarelli says. A lack of any such a sighting within the 10-year timeframe, on the other hand, would necessitate a rethink of whether and how supermassive black holes merge, she adds. While those gravitational waves are strong, they lie outside the wavelengths currently observable by ongoing experiments such as LIGO and Virgo. The new hunt for gravitational waves formed by merging supermassive black holes will instead leverage stars called pulsars that act like cosmic metronomes. The rapidly spinning stars send out a steady rhythm of radio wave pulses. As passing gravitational waves stretch and compress the space between Earth and the pulsar, the rhythm slightly changes. Those changes are then monitored by pulsar-watching projects on Earth. "As the gravitational wave transits the Milky Way, it stretches and squashes space-time, making the pulsars and the Earth jiggle," Chiara Mingarelli, an astronomer from the California Institute of Technology in Pasadena, told Space.com. "And we can measure that jiggle by looking at changes in the arrival time in the pulses." Two pulsars "are like the interferometer arms on LIGO, but instead of being 4 kilometers long, they're 3,000 light-years long," Mingarelli added. "A pulsar timing array is really a galactic-scale gravitational-wave detector." Mingarelli and colleagues estimated how long those projects will take to spot their first supermassive black hole merger. The team cataloged nearby galaxies that may host pairs of supermassive black holes. The researchers then combined that information with a map of nearby pulsars to find—for the first time—the probability of a definitive detection over time. One surprise from the results was which galaxies are most likely to offer the first glimpse of supermassive black hole merger. Bigger galaxies mean bigger black holes and therefore stronger gravitational waves. But bigger black holes also merge faster, reducing the window during which gravitational waves may be detected. 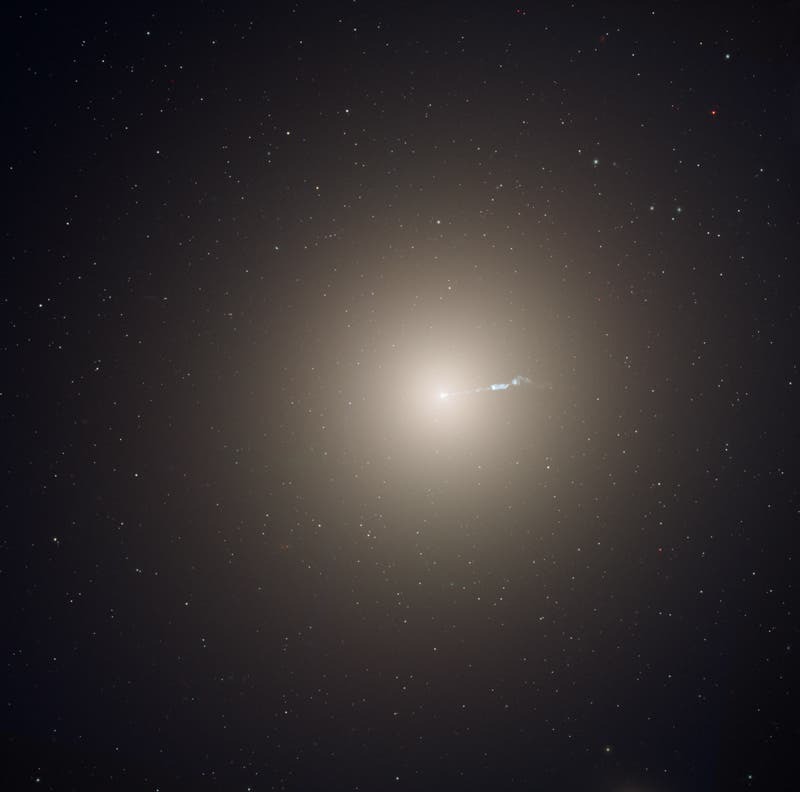 A black hole merger in a massive galaxy like M87 (above) would yield detectable gravitational waves for 4 million years, for instance, while a more modest galaxy such as the Sombrero Galaxy would offer a 160-million-year window. M87 is one of the most massive galaxies in the local universe, notable for its large population of globular clusters –about 12,000 compared to the 150–200 orbiting the Milky Way. A successful detection would give astrophysicists a better understanding of the astrophysics at the hearts of galaxy mergers, Mingarelli says, and provide a new avenue to study fundamental physics not accessible by any other means. The number of individual supermassive black hole binaries seen also offers a measure of how often galaxies merge, which is an important measure of how the universe evolved over time. If a supermassive black hole merger isn't seen, it could be because the black holes stall at around three light-years (or one parsec) of separation. This conundrum is known as the Final Parsec Problem. The two black holes close together gradually over time as their orbits degrade as energy is lost generating gravitational waves, but the process can take longer than the current age of the universe. A Neutron Star Collision in Our Milky Way Neighborhood –"Could Wreak Catastrophe on Earth"
SETI Alien Sleuth 'Skewers' Pentagon's Secret UFO Program –But Believes "Advanced Intelligent Life Will Be Confirmed Within Next 20 Years"
"Vestiges Exist of a Universe Prior to the Big Bang"
The Extraterrestrial Mirror –"There's a Level of Predictability to Evolution that Aliens Would Look Like Us"